In a epic battle of great goalies, Henrik Lundqvist prevailed over Carey Price to lead the Rangers to a very satisfying six-game series win over the Canadiens. He stopped 195 of 206 shots to win the battle head to head. AP Photo via Getty Images courtesy NYRangers. Entering the playoffs, the lingering questions still were being asked. Could Henrik Lundqvist put behind the worst season of a brilliant career? The proud 35-year old Swedish King answered it loudly. In resounding fashion, he outplayed Carey Price in the Rangers’ big first round series win over the Canadiens. When the chips were down, the veteran netminder was there to make the key stops against an offensively challenged opponent. In the end, the Rangers’ superior depth won out. Both up front and on the blue line, they were the better team. Even playing a more physical style unfamiliar of an Alain Vigneault coached team, they hit back just as hard. Indeed, they turned back the clock to the days of the John Tortorella Black and Blueshirts sacrificing their bodies at every turn. On a night they came out flat falling behind early, the Rangers showed the playoff mettle and resilience of an experienced group that had been there before. The best aspect is they did it in front of the Garden Faithful to prevail 3-1 in a hard fought Game 6 eliminating the Canadiens to advance to the second round. They’ll either play the Senators or Bruins in the Atlantic Division Final. They won because Lundqvist was the better goalie. He got the better of the 29-year old all world Price, who honestly deserved better too. His team didn’t score enough. Following their Game 2 and 3 victories in which they totaled seven goals, they were held to four in the last three. In the Rangers four wins, they outscored the Canadiens 10-4. Lundqvist stopped 114 of 118 shots in Games 1, 4, 5 and 6. For the series, he allowed only 11 goals on 206 shots. How good is that? Try a 1.70 goals-against-average with a .947 save percentage and a shutout. Comparatively, Price gave up 12 goals on 179 shots. That translated to a 1.86 GAA with a .933 save percentage. He didn’t get enough support. If anyone in Montreal is pinning the blame on the former Vezina winner, they should look at a roster that featured captain Max Pacioretty, who was held without a goal in the series. The Habs’ best skaters were Alex Radulov, Brendan Gallagher, Artturi Lehkonen, Tomas Plekanec and Shea Weber. Radulov was dangerous throughout setting up defenseman Alexei Emelin’s goal in the first for a Montreal 1-0 lead. He led all scorers with seven points including the overtime winner in Game 2 after getting the primary helper on Plekanec’ tying goal with 17.3 seconds left. Gallagher was a royal pain in the neck taking the puck to the net while battling hard. He finished with a goal and two assists. Plus a few bruises. Lehkonen had a fine series tallying two goals and two helpers. Plekanec wound up 1-2-3 while dominating on face-offs going 56.2 percent. The Rangers prevailed despite only getting an empty net goal from Derek Stepan with 18 seconds left that clinched the series. He had a goal and assist and admitted to struggling afterwards. Mats Zuccarello came alive with two goals including the game-tying and series clinching. The pesky Norwegian wound up with three goals including two game-winners while being the Blueshirts’ more skilled version of Gallagher. He took his lumps and dished out some punishment. Some of it illegal in a nasty series where they let them play. Mika Zibanejad turned his series around with the overtime winner in Game 5 along with a primary helper on gritty teammate Jesper Fast’s shorthanded goal. He really played better between Pavel Buchnevich and Chris Kreider. The trio had chemistry just like they did at season’s start. Buchnevich added a lot of speed and skill but also wasn’t afraid to get the jersey dirty. He made Kreider more effective. Kreider was more noticeable. He set up Zibanejad in Game 5 by using his speed and firing a shot that worked as a perfect pass off Emelin for the OT winner. Coach Alain Vigneault gets a ton of credit for realizing he needed to make changes to the lineup following a dismal performance in Game 3. He subbed Buchnevich for Tanner Glass and mixed up his lines. All four were more effective afterwards. This isn’t a knock on Glass, who did a fine job in his role on the fourth line even getting the winner in a 2-0 Game 1 win. They just needed better offensive balance. Buchnevich allowed for that. Vigneault moved Jimmy Vesey up with Stepan and Rick Nash. A combo that was very effective as well as responsible. Vesey only finished with two assists but his all around effort was noticeable. He finished checks and was around the puck a lot. His play to draw two Montreal defenders and pass for Nash, whose rebound went right to rookie Brady Skjei for the momentum shifting goal that tied Game 5. There he was taking a pounding from a frustrated Pacioretty, who crosschecked him twice. Eventually, Vesey went back at him with both earning matching fighting majors and two extra for seven penalty minutes. The combination Vigneault was waiting on finally came up big. For two games, Kevin Hayes, J.T. Miller and Zuccarello were out of sync. Particularly Miller, who played two miserable games. It looked it would be much of the same from him following an awful first in which he made some back passes to nobody fueling Montreal’s transition. But Vigneault stuck with them. In this instance, he was right. I thought maybe it was time to try Fast on the line and put Miller with Oscar Lindberg and Michael Grabner. Luckily, the coach didn’t. Hayes had come off a effective Game 5. He had been winning face-offs but still hadn’t registered a point. Both he and Miller were without one entering Saturday night. But in the second, the Rangers were a different team. The trio of Hayes, Miller and Zuccarello led the way with great puck possession and a relentless forecheck that got the crowd into it. Zuccarello converted a power play goal off a great touch pass from Zibanejad in which he handled the puck and in one motion fired it past Price with little room. The one power play goal they needed in the series. Vigneault’s best chess move was countering with the Hayes unit when Claude Julien sent out his fourth line and third D pair for a defensive draw. It made no sense. The Montreal fourth line was effective in the offensive zone crashing and banging bodies. But they were no match for the shift Hayes, Miller and Zuccarello put together. Hayes didn’t give up on the play recovering a loose puck on a back check. Then Miller eventually got the puck to Hayes in the slot where he didn’t shoot. Instead passing across for Zuccarello, who got loose to put a shot off Price and in with 6:29 left in the second. 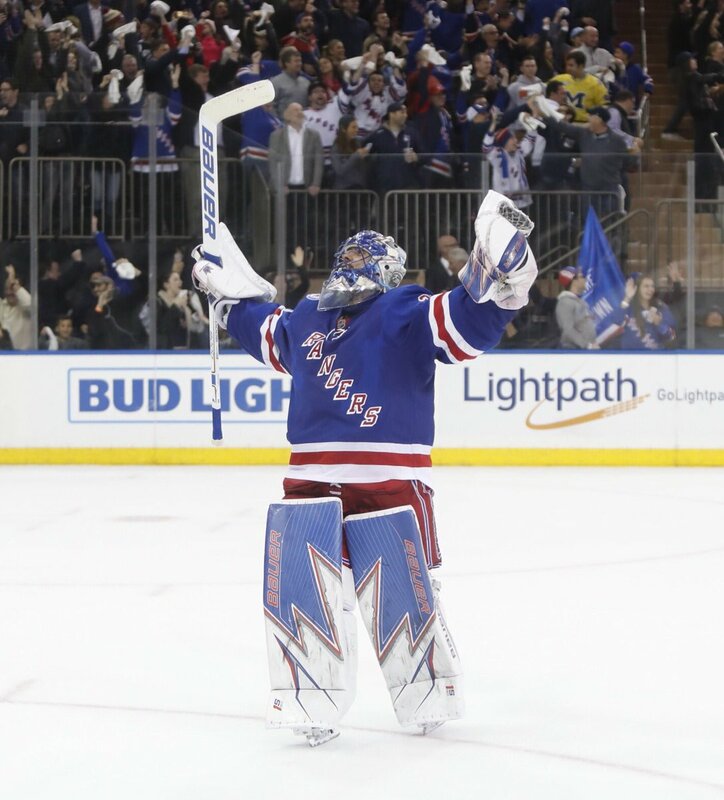 But in a series that was about the goalies, Lundqvist had to come up with two fantastic saves. The first coming on Weber during a Montreal power play. With Miller off for high-sticking, here came a lethal Weber one-timer from the left circle ticketed for the top of the net. The velocity was top shelf but Lundqvist reached back and got enough of the puck with the thumb of his glove keeping it out. He then shook his head as if to say, ‘No.’ A remarkable stop that will be replayed for a few days. That save was the one that finished the Habs. Along with 27 blocked shots including a diving one from who else but Dan Girardi, it led to Stepan flipping a perfect lob clear all the way down into the empty net to seal the victory. In the end, their best players stepped up including captain Ryan McDonagh, who picked up an assist on Zuccarello’s power play goal. He only finished with two assists but was instrumental in turning around the series. He and partner Girardi were outstanding throughout in stifling Pacioretty and Montreal top center Phillip Danault. Neither scored a goal only totaling five assists between them. As a team, the Rangers proved to be better. They can thank Lundqvist for a clutch performance. Who said he was done? He ain’t finished yet. This entry was posted in Column, NHL Playoffs, NYRangers and tagged 2017 NHL Playoffs, Alain Vigneault, Alex Radulov, Alexei Emelin, Artturi Lehkonen, Brendan Gallagher, Canadiens, Carey Price, Chris Kreider, columns, Dan Girardi, Derek Stepan, Henrik Lundqvist, J.T. Miller, Jimmy Vesey, Kevin Hayes, Mats Zuccarello, Max Pacioretty, Mika Zibanejad, Pavel Buchnevich, Rangers, Ryan McDonagh, Shea Weber, Tomas Plekanec. Bookmark the permalink.